USB block chargers are a common household item in this age of electronic devices. We need them for charging laptops, smartphones, tablets and more. 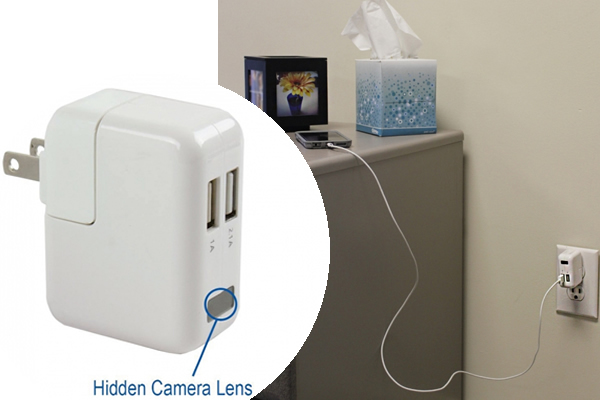 So what better device to house a hidden spy DVR camera than a USB wall charger? Inside this functional USB wall charger is a 1080p enabled 80 degree viewing angle camera that can record hours of hidden footage in one of two recording modes: motion detection or continuous. While it comes with a 8GB SD card, using an optional 32GB SD card, you’ll get about 15+ hours of continuous video, or with motion activation mode only, you'll virtually never run out of video memory. The choice is yours. It’s easy to capture weeks to months of hidden videos on the SD card. Additionally, you’ll be able to “hot-swap” SD cards by easily removing a filled up one, and replacing it with a fresh blank card. This way you’ll quickly be able to bring the footage back to your computer for review without ever missing important video. When you’re ready to watch the video, use the included USB cable to connect the device to your computer, or remove the SD card, pop into your computer, and watch the video. Easily save the video files to your computer for unlimited archiving. Capture & watch only the action. No more sitting through hours of video watching an empty room. The motion detection mode will record in intervals until motion stops. This ensures you’ll never miss a thing. Simply insert microSD card, slide the Function Switch to the right, and plug into a standard wall outlet. A red light will stay lit for approximately 10 seconds, then blink 3 times letting you know motion activation is armed and ready. The device will begin recording when motion has been detected. Take out of the box, and plug into any wall outlet to instantly start recording video. Quick. Simple. Easy. Simple and easy to set up and watch short videos the next day. Recording area is limited to specific area of where deployed. For the price, can't go wrong. I had a quick call with support and they are great!